The Harvard-Stow-Bolton area is orchard central in the fall. The area is great for crisp autumn running, with scenic side roads rolling by orchards, with great views of the Nashoba Valley. We’ve provided three routes in the area, two of them from the Apple Harvest Ramble, which starts from the classic town center of Harvard. Apple Harvest 10-miler (actually 9 miles). Start in Harvard Ctr. Head up Under Pin Hill Rd., making its way to Prospect Hill Rd., running by the spectacular setting of the Fruitlands Museum. The second half of the route features a section of Rt. 110, east to W. Bare Hill Rd. Apple Harvest 5-miler. Also starts in Harvard Ctr., but is a different route, using Old Littleton Rd. to head up to the Harvard Observatory, then heading south for 3 miles along Pinnacle, Oak Hill, Slough Rd., then north along Bolton Rd. back to the center. 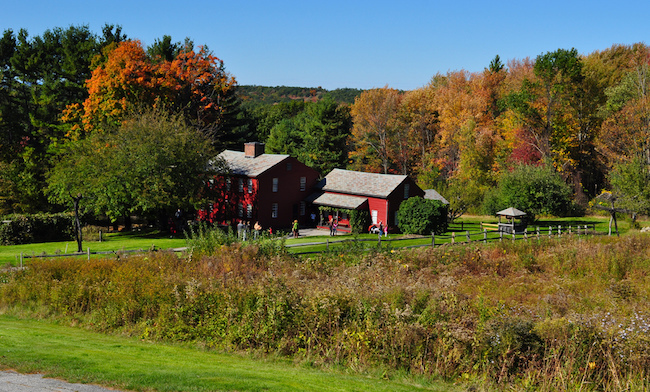 Stowe Orchards. Uses 2 miles along the newly completed Assabet River Rail trail, and then heading by Honey Pot Hill Orchards and the Stow Acres Country Club. 3.9 miles one-way.